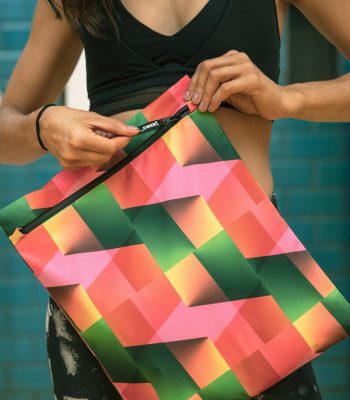 A unique, social enterprise, Project_Sweat combines cutting-edge design, advanced technical fabrics and a charitable mission, resulting in a series of bespoke kit bags which are visually striking, sustainable and can benefit women around the world. Project_Sweat is a collaborative initiative, founded on the simple idea that designing a better kit bag could make a world of difference. The project was originated in 2015 by Social Entrepreneur David Balhuizen, who set out to find a solution to the unnecessary, repeat use of plastic bags for wet or sweaty gym gear. With this in mind, Balhuizen approached Marie McMillan Guy, Joint Head of Innovation and Business at Central Saint Martins and together they devised the foundations for a socially-engaged enterprise which would teach our graduates entrepreneurial skills, contribute to charities which support women in education and produce a new, advanced waterproof bag for everyday use. The resulting Project_Sweat kit bags are designed to fully enclose damp swimsuits or sweaty activewear. They are composed of a three-layer bonded fabric with no breathability, ensuring any moisture stays inside the bag, while the welded seams prevent any leakages. With a water-resistant finish, any water that comes into contact with the bag’s surface is also repelled. 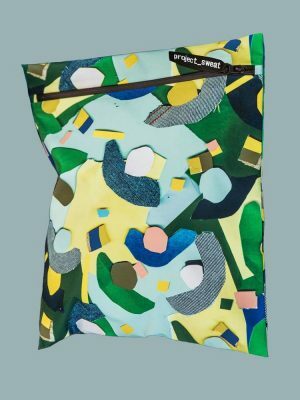 The various, graphic bag motifs have been designed by two Central Saint Martins BA Textile Design graduates, Anna Schlimm and Georgia Fleck. Contributing to the company’s strong visual direction, Schlimm was also commissioned to produce the brand logo. For our graduates, this project not only showcases their design skills, it also gives them a direct opportunity to engage with the possibilities of the product market. In a unique, employee-ownership framework, they are also able to retain an enduring part in something they helped created, as on top of their sale royalties, they have been given shares in the company. Created with women in mind, designed by women and helping women across the world, Project­_Sweat is a circular economy of female skills, talent and opportunity. Through the act of solving a common, everyday problem, this collaborative enterprise brings together bespoke, quality design and educational tools which encourage creativity and exploration. Project_Sweat is a collaboration with Central Saint Martins, University of the Arts London, formed by David Balhuizen, Marie MacMillan Guy and Monica Hundal, Joint Directors of Innovation and Business and with the guidance of Anne Marr, BA Textile Design Course Leader. You can purchase the Project_Sweat kit bags here. If you order the “Refraction” style and use code P_S10 you will receive £10 off your purchase.